Rose site users, we are delighted to announce that we have added another manuscript to our repository, Bibliothèque municipale de Grenoble 608, aka Grenoble 608. 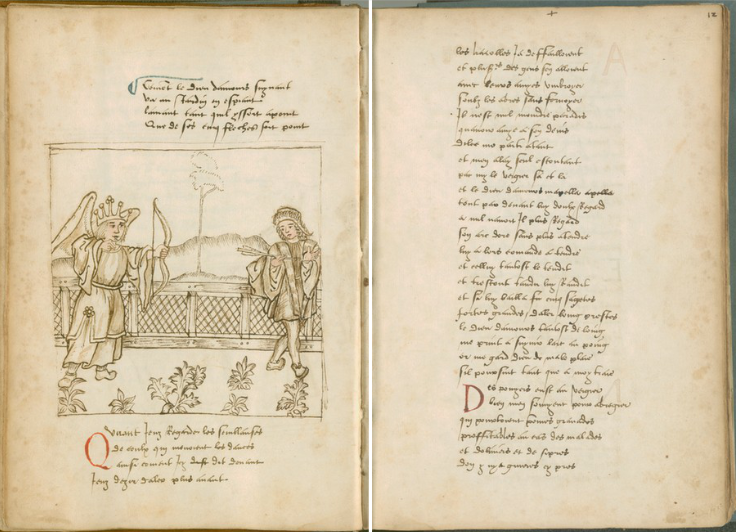 This 16th-century handwritten codex is chock full of illustrations – 88 pen and ink drawings, with light coloring in places, adorn the manuscript’s 143 paper folios. These fascinating depictions, which are somewhat amateurish in their execution, are accompanied by at times less-than-perfect scribal work. It seems the product of a smaller purse than some of the illuminated Rosemanuscripts, which makes it perhaps all the more alluring as an object of study. Was it copied hurriedly for a middle-class, middle-income household? Did the first owner pen the drawings themselves? Our project to tweet a modern English version of the Rose continues, you can follow us @RoseDigLib #RoseRom.